Alaska Marine Lines celebrated the launch of its newest barge, Skagway Provider, at a ceremony July 7 at Gunderson Marine in Portland, Ore. where the vessel was constructed. The heavy deck cargo barge will make its maiden voyage from Seattle to Southeast Alaska July 29 and will begin serving Alaska Marine Lines customers on the Seattle to Southeast Alaska route. The Skagway Provider’s 360’ x 100’ x 22’ hull has capacity for 13,200 tons of cargo or about 800 20-foot containers. 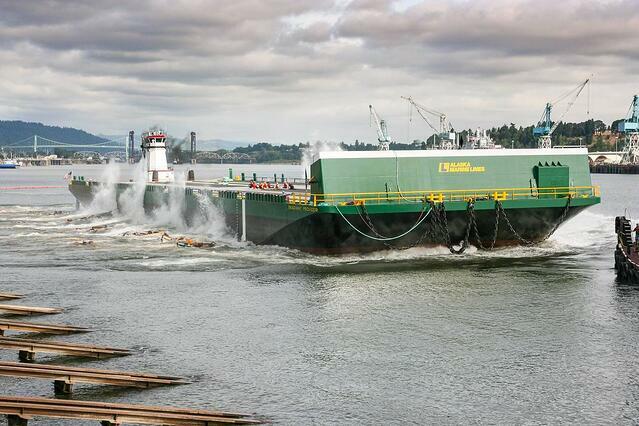 It is in the same class as Alaska Marine Lines’ barges Sitka Provider, Southeast Provider and Stikine Provider. Gunderson Marine has been a long and valued supplier, constructing 16 barges for Alaska Marine Lines over the past 18 years and continuing to invest in efficiency and new technology. Alaska Marine Lines offers twice weekly barge service to Southeast Alaska including Juneau, Ketchikan, Petersburg, Sitka, Haines, Skagway, Wrangell, as well as twice weekly service to Central Alaska, seasonal service to Western Alaska, and bi-weekly service to Hawaii. Charter services are also available. Current sailing schedules can be viewed online at www.lynden.com/aml/barge-schedule.html. Alaska Marine Lines is part of the Lynden family of companies. Alaska Marine Lines and LTI, Inc. donated the transportation of a ceremonial totem pole from Bellingham, WA to Hoonah, AK for a June 4 dedication in the Tlingit village. Carved by Scott Jensen, Jeff Skaflestad and Fred Fulmer at Jensen's Bellingham studio, the totem was requested by elders of the Chookaneidee Clan to replace an ancestral totem pole that, according to legend, served as a source of wisdom, protection and direction for the clan's shaman when the clan was located at Glacier Bay, AK. The advance of the "Little Ice Age" between 1300-1870 drove the Tlingit out of Glacier Bay. The pole remained and was eventually enveloped in ice. "After Glacier Bay was designated a national park, the clan was not allowed to return to their homeland," explains Master Carver Scott Jensen. "The clan relocated in Hoonah and, years later, the totem reappeared in the creek there. Although the pole is now gone, the clan elders have wanted to replace it for generations." 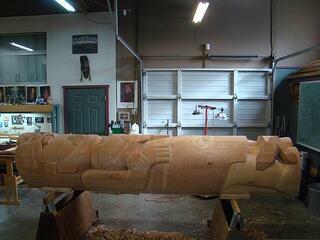 Skaflestad relocated from Hoonah to Bellingham and Fulmer from Juneau to help Jensen carve the totem in his studio. After five months of work, the totem was finished and ready to begin its journey to Hoonah. Jensen called Lynden for help. The Alaska Marine Lines team arrived at Jensen's Bellingham studio in May to pick up the 11-foot, 2,000-pound totem, which is considered both a clan and shaman pole. The crated totem pole was secured on a trailer for the ride to Lynden, WA where LTI, Inc.'s Tom Rainey used a forklift to carefully place it into a container for the ride to Seattle and transfer onto the barge for the journey to Southeast Alaska. In Petersburg, AK, the pole was transferred barge to barge for the final leg to Hoonah. "As a company serving Alaska for over 60 years, Lynden is proud to provide the transportation to bring this important ancestral piece back to Hoonah," says Executive Vice President Alex McKallor. Although the elders who requested the new totem passed away before the dedication in June, the carvers say the ceremony was very moving. "We felt the presence of our ancestors," says Skaflestad who is part Tlingit. 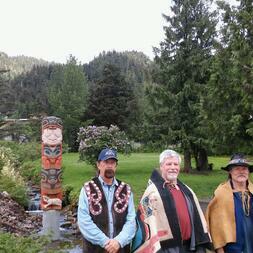 "There were many tears as we placed the totem pole in its ceremonial location in the creek. It was a proud moment of unification for all of us." "We feel very blessed to have Lynden's support in this project," Jensen says. "Each member of the Lynden team took great care in making sure the totem was safe and secure along its journey."